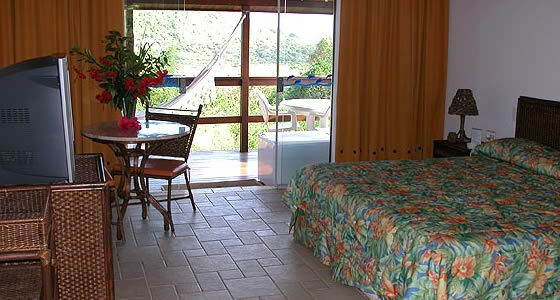 Recommended Pousadas in Fernando de Noronha. Almost all of the pousadas on the island are homey, comfortable and friendly. The perfect pousada is the one that will work best for your pocketbook and your activity level. However, there are a few that stand out. This three dolphin establishment offers suites and quaint bungalows. It is located next to Morro de Pico, a well known rock formation. This pousada is focused on being environmentally friendly, as it uses solar power to run its whirl pools. There is an outdoor pool and an American bar. Spa services include a sauna and massage therapies. There is a gym, coffee shop and a restaurant with outdoor dining. The rooms are air-conditioned and have flat screen televisions and hammocks on their porches. Another fun 3 dolphin inn is Pousada Teju Acu. The rooms are in small bungalows that look like tree houses. This pousada is decorated local handicrafts including onion skin lamps. The pousada has been designed to make the outdoors blend nicely with the indoors. Activities that can be arranged by the owners of this pousada include diving, sailing, horse back riding, surfing and eco-trekking. Each balcony has a hammock and the rooms come with king sized beds, flat screen TVs, solar hot water, and air conditioning.